Angry performers at Young Vic meeting condemn Arts Council England’s for its “isolated and high-handed” approach to decision-making and set out the artistic community’s demands for a more transparent and fairer funding process. 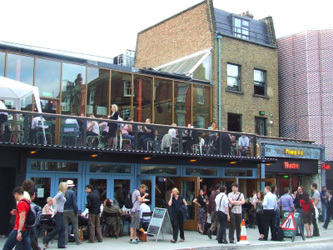 In a packed meeting at the Young Vic Theatre, London, on 9 January 2008, representatives from across England’s theatre industry declared they had no confidence in the work of Arts Council England (ACE) and rejected its proposals to cut funding to more than 190 arts bodies from April this year. The meeting, organised by Equity, was addressed by Peter Hewitt, Chief Executive of ACE, but his attempts to explain the rationale behind the decisions taken by the funding body were rejected by an audience of more than 600 at the standing-room only event. The gathered audience included performers, creative workers and representatives from many of those theatres facing cuts. They were particularly angry about the inadequate consultation period (just five weeks which included Christmas and New Year holidays), the secrecy with which the proposals had been produced and the failure of the Arts Council to make explicit the criteria by which some theatres had been chosen over others. The meeting ended with a vote of no confidence in the way Arts Council England operates, moved by veteran actress Miriam Karlin and passed unanimously. The Equity-organised meeting was to prove a pivotal moment in the campaign against the cuts. By bringing together the scattered voices of those who felt aggrieved at the undue secrecy and unfair haste in which the funding process had been conducted, the meeting made it clear that the concerns of the arts community stretched far beyond those employed by the affected companies. It shifted the issue from a series of local campaigns to a serious national debate. The coverage in the national and regional press that followed Equity’s meeting was overwhelmingly hostile towards the decisions of Arts Council England. It was soon clear that some sort of climbdown by the funding body was inevitable. But Equity was pushing for a more fundamental reform of the way the Arts Council worked (see “McMaster Sets Out Ambitious Reform” – page seven). In the wake of the Equity campaign and the high-profile interventions by Equity members, the eventual announcement of the Arts Council decision saw a number of important theatres reprieved. Those saved include the Northcott, the Bush, the Bristol Old Vic, Harrogate, the National Student Drama Festival, Jacksons Lane, the Orange Tree, Eastern Angles and the Birmingham Opera Company. But there was bad news for 185 organisations as it was confirmed that they would get no further support from April this year. Equity is continuing to campaign for reform. Over the coming year the union’s campaign on theatre funding will develop into a new “manifesto for theatre” with the goal of developing a forward looking policy to put UK theatre on a firm footing and to ensure that all the major political parties sign up to the best possible deal for the arts.The first part of that campaign is a major survey of member opinion about arts funding which you can find online at http://neiru.notlong.com. More details on page seven.